Exile Tibetan protesters shout slogans against China during a protest outside the Chinese embassy in New Delhi on 17 July 2015. 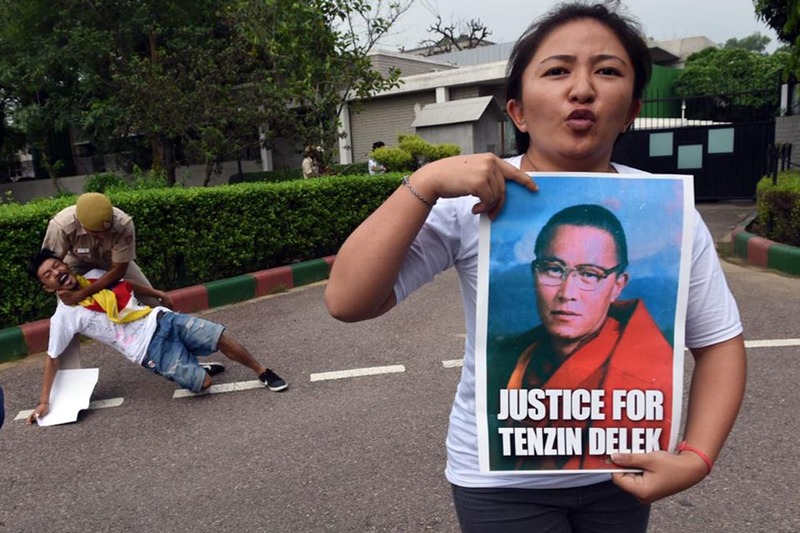 Tibetans were protesting the untimely death of Tenzin Delek Rinpoche, a prominent Tibetan spiritual teacher, in a Chinese prison. The cause of death of a Tibetan lama who was serving a life sentence in a Chinese prison was cardiac arrest, according to state media. Tenzin Delek Rinpoche died 13 years into a sentence on charges of financing and supporting a series of terrorist bombings and secession activities. His supporters say the charges were trumped up, and his family had complained last week it had been denied access to his death certificate and medical records. The 65-year-old had studied under the Tibetan spiritual leader the Dalai Lama – who Beijing considers a separatist ‐ in the 1980s, and been recognized by him as a reincarnated lama. The official Xinhua News Agency reported late Saturday that a prison guard had found Tenzin Delek suffering from respiratory failure about two hours after the monk began to take his usual nap on July 12. Prison doctors gave him emergency treatment and he was taken to a hospital and declared dead after further treatment. Last year, the monk’s family had applied for medical parole for him on the grounds that he suffered from a heart condition, high blood pressure, dizzy spells and problems with his legs that had caused him to fall down frequently. Xinhua said that prisoners serving life sentences are not allowed medical parole. His body was cremated on Thursday in Chengdu city in Sichuan province, where he had been held for the last 13 years. A Tibetan rights group, the New York-based Students for a Free Tibet, said around 30 Tibetans from his immediate family and students were allowed to see the body before the cremation and perform a short prayer. They had wanted to perform Tibetan Buddhist funeral rites on his body in Lithang, his hometown in a Tibetan area of Sichuan.